Artwork Approval is a process that begins with an order and continues through the artwork's approval. To help track the different steps in that process, Cyrious has created Artwork Group Statuses. They are a unique set of statuses that apply to each artwork group. The list of Artwork Group Statuses are listed below along with a description of each. When the status of the Estimate changes from Pending, the artwork status is automatically adjusted as indicated in the following table. 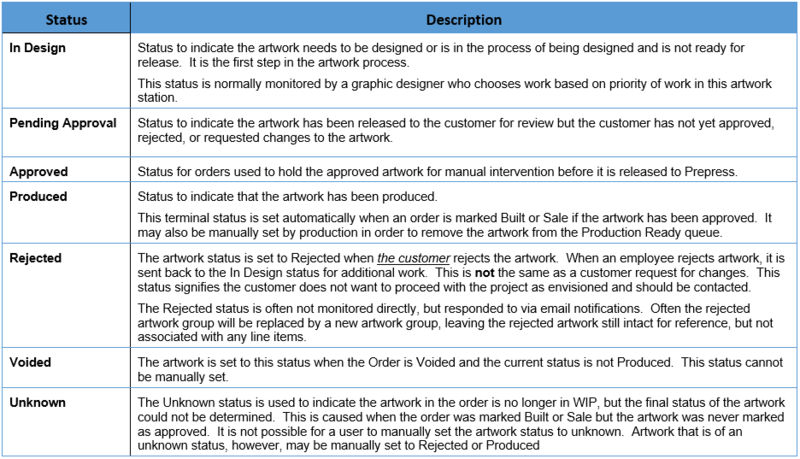 When the status of the Order changes from WIP, the artwork status is automatically adjusted as indicated in the following table.